What do you think of this BBQ Bear Claws? 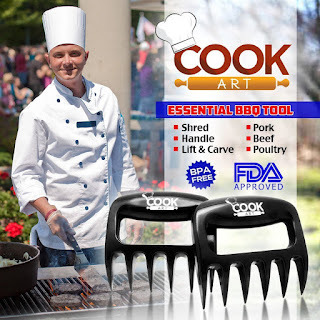 Your search for the best BBQ meat handlers is finally over! Get ready to pull 40 lbs of pork butts in less than 20 minutes. Move the hottest slow cooked or smoked meat without burning your fingers with these stay cool handles. The sharpest claws for shredding pork or beef and carving poultry without worrying about cutting yourself! Cleaning is a breeze after shredding 8 pounds of roast under minutes, simply toss them in your dishwasher! Carry them around with you, and use them to defend yourself from predators! That's right, you don't need to keep these only in your kitchen make an unwanted guest think twice before approaching you as these serve as the prefect self defense device! BONUS QUESTION! Who has the best price? Today the US site has it for 67% off, but it still could be the Canadian Amazon site!